I’m usually pretty even tempered with the places I visit, even when they excite particular emotion. However, some places do get right up my nose. Having visited Tony Macaroni, earlier today, it’s so hard to sum up the experience in our usual bright and breezy format. 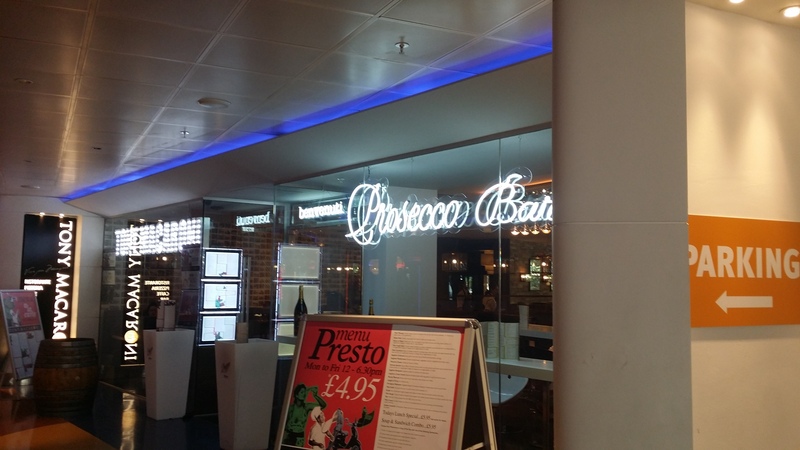 In a parade of restaurants in the Omni centre that includes Frankie & Benny’s and the Slug & Lettuce, their premises looks rather bright and smart. It’s a huge place. The atmosphere reflects the mall setting, so has a slight edge of fevered parental anxiety about it. Their daytime selection focusses on their £4.95 presto menu. Although I didn’t notice it on the way in, there’s a little asterisk next to the £4.95 element. None of the items actually costs £4.95, you see. 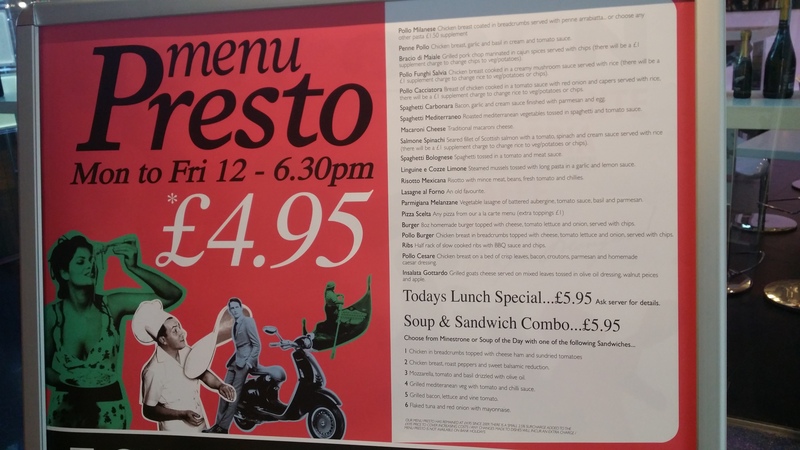 The small print outlines that given that they’ve held the price of this menu at the same level since 2009, they now apply a 2.5% surcharge to “cover increasing costs”. 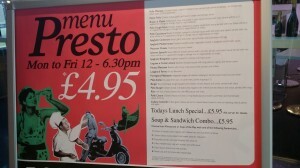 So, this is in fact a £5.07 presto menu, which is apparently a much less saleable notion. 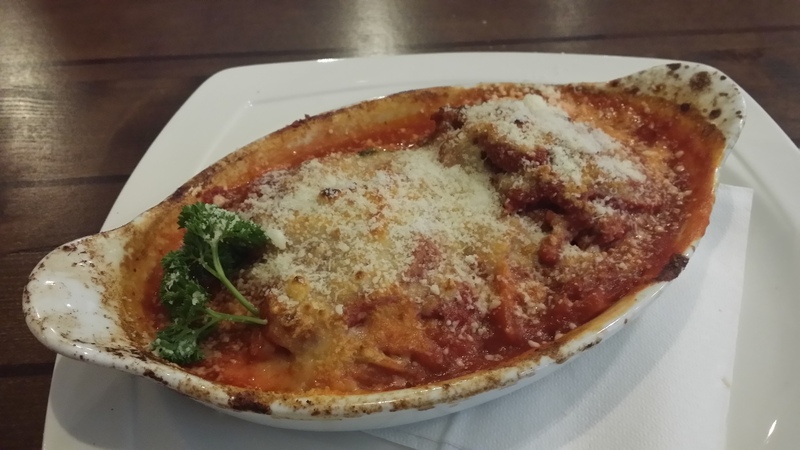 Anyhoo, they offer a wide selection of choices, from which I opted for a favourite of mine, melanzane parmigiana. Some rather muddled service meant that it took a moment or two to arrive. This dish is rarely a looker, but one little spring of defeated parsley didn’t really help matters. It proved to be comfortably the poorest version of this dish I’ve been served; it was way below the standard of a restaurant dish. The aubergine was very unevenly cooked and if I hadn’t been in possession of an extremely voracious appetite it would likely have been sent back. So overall, Tony Macaroni was really poor. I dare say that if you approach it on more solid pizza or pasta ground, it will serve you decently, but my experience was massively poor. 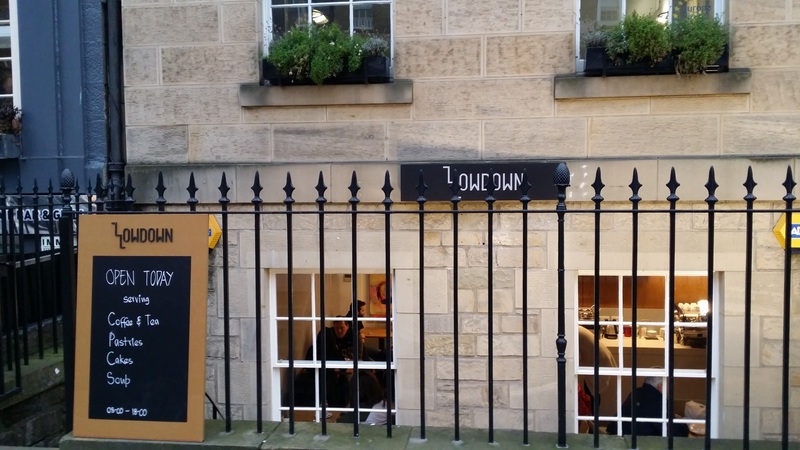 I hear they’re in the process of reviewing the menu across all of their restaurants in Scotland. That review can’t come soon enough, for all concerned. oh dear, one to miss! I don’t know whether to laugh or weep at the 4.95 Presto Menu! Maybe that’s what they are reviewing! I love Aubergine too, and this dish, so would’ve been so disappointed too! Oh my, poor Blythe… next time you want parmigiana come to my house, I’ll make it for you… and hubby will be very happy as a result as well!